This page provides information on the command structure and port settings for communicating with the QTFM. This is normally performed automatically by the QuSpin user interface, but the simple communication also allows for full access using a terminal emulator. 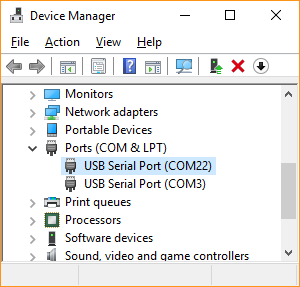 Figure 1: Windows Device Manager showing a list of USB Serial Com Ports devices. This page last updated on May 16, 2017. The QTFM electronic control unit (ECU) accepts serial commands from a computer through a USB virtual Com port using the provided Power/Coms board (USB-UART bridge), or by directly accessing the UART Rx and Tx lines from the ECU. A simple terminal emulator (such as Tera Term or minicom) can be used to fully control the mag and stream data. The USB bridge uses the FT232RL chip. If drivers are not loaded automatically through Windows, they can be downloaded here. The digital stream from the sensor electronics is classified into three types, delimited by the first character as described below.
! Magnetometer digital data output. The magnetometer data is sent as lines of ASCII text and is delimited by the ‘!’ character with the line terminated by the carriage return and linefeed characters (\r \n). The composition of the data line changes to include more data at slower decimation times. Decimation modes range from 2 to 11. The table below shows the data line format for different decimation modes. The magdata value is converted to nanoTesla by dividing by 6009.342147 (or alternatively multiplying by 1.664075660e-4). The following table provides a list of single-character ASCII commands for operating the QTFM (case sensitive). Coms check ! 33 Reports back as "#Check"
~drt'x' Change default decimation time from startup. 'x' represents a number starting from 2 with decimation time according to T = 6.144e-4 seconds *2^x. The following table provides a description of the star codes that represent the current state of the magnetometer, reflected by the LED pattern/color on the ECU. Star codes messages are ASCII strings sent by the ECU over the serial com with the following form: “*” followed by a number from 0 to 5. They are sent upon state change of the magnetometer or can be queried with the single-character command ‘r’.